To request a quote, just use the form below to confirm which event you are attending (or location for non-event rentals), when you will be there, how many people in your group and if you have any preferred RVs from our fleet. Alternatively if you have any questions or need help finding the best motorhomes for your requirements, call our friendly team on 01761 300489. We also offer Live Chat if you prefer, so just click the speech bubble icon below right. We’re open Monday to Friday from 9:00 am to 5:00 pm. Important note: If you’re wanting to drive an American Motorhome rental, then please note our motorhomes are not available for self-drive hire. 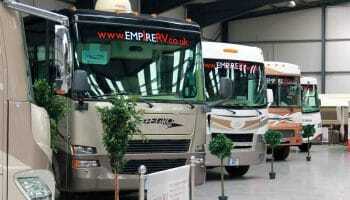 Their size and UK insurance laws mean only our Empire RV team can drive and deliver them to your chosen event. Pop in to our Somerset HQ! If you would like to meet us face-to-face or have a look around, our 30,000 sq ft facility is open from 9am – 5pm Monday to Friday and by appointment on weekends and bank holidays. Our premises are conveniently located off the A37, 200 yards west of the junction with the B3139. Please note: During the busy rental months of May-September, it is always best to call us before you visit as many of our vehicles will be off-site at events.